Sequel to easily one of the best Zombie games on the Xbox 360, Dead Rising 2 had a lot to live up to. 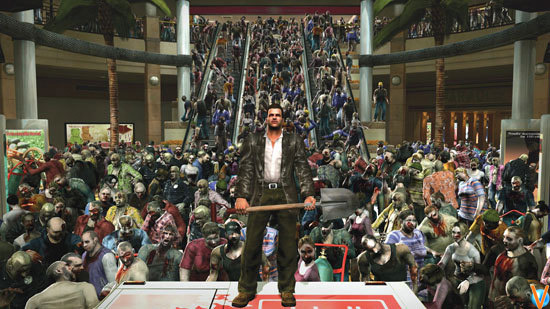 The number of Zombies Dead Rising 2 shoves on the screen, similar to its predecessor, is simply overwhelming at times. The Leveling-up system which grants players new moves by killing more and more zombies just gives you another reason to beat the undead hell out of every single one of them on their feet. Combo-cards which can be found throughout the game make exploration interesting and most importantly allow players to combine weapons into super weapons that last longer, inflict more punishment and lend to a new experience. Also, the coop-mode lets you team up with your buddy and double team the Zombies. Deadly Weapons, addictive gameplay, replayability incentives and a great coop-mode make Dead Rising 2 a complete Zombie-fest in the perfect sense.